Today’s Earth Day and I’m excited to participate in a fun blogger challenge. In honor of today, a group of bloggers is sharing vegetarian recipes and/or sustainable food. My kids have been on a little boycott of all vegetables. Not sure why now, but I’m starting to work on them again. I’m looking forward to seeing what everyone shares today! Make sure you check out everyone’s recipes below. I really enjoyed this orzo salad. You can eat in hot, room temperature or cold. I tried it all three ways and preferred it at room temperature. 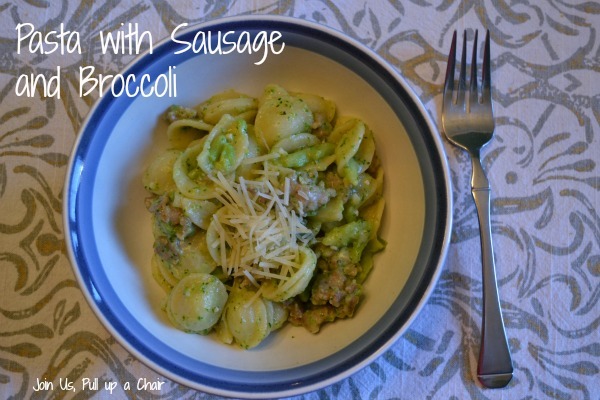 It was easy to make and you can easily switch out any of the veggies to use what you have on hand. The original recipe called for pine nuts and feta, but I omitted those. Happy Sunday! I hope you’re having a great weekend. We’ve had a low-key weekend and is exactly what is needed before a crazy, busy week. Last week, I picked up a CSA share from a local, organic farm and received a bunch of carrots, zucchini and kohlrabi. I never had kohlrabi before but knew it was similar to a turnip – which I love, but it’s a little sweeter and milder. I decided I was going to make fritters with these three veggies and top them with a herb lemon yogurt sauce. It was great way to use them and work on eliminating any waste. The yogurt sauce was bright and helped lighten up the dish since the fritters are fried in olive oil. The combination the zucchini, carrots and kohlrabi was perfect and you could swap any veggies out for ones you don’t like. Having breakfast for dinner is one of our favorite meals and recently I’m looking for ways to sneak in veggies into our dinners. My kids have become picky and hate vegetables, but if I can sneak them into something there’s a better chance of them eating them. Anyone else struggle with this? I don’t know what happened. They used to be really good about eating veggies, but then a flip switched and they gag and refuse to eat them. I don’t fight the issue since dinner time falls in “witching hour” and we have enough other problems to work through. This recipe did the trick and they both gobble it up. I served it with a side of roasted potatoes and some fruit. The squash and kale went perfectly together and made for great leftovers too! Preheat oven to 425 degrees. Coat the squash with 1 tablespoon of olive oil and season with salt and pepper. Roast for 20 to 25 minutes or until the squash is soft and slightly browned. Remove from oven and set aside to cool. Reduce the oven temperature to 375 degrees. In a large skillet, heat the remaining tablespoon of olive oil over medium heat. Saute the chopped onion until softened and then add in the kale. Continue to cook until the kale has wilted. Remove from heat and toss in the roasted squash. While the vegetables are cooking, whisk together the eggs and half and half. Season with salt and pepper. Stir in the shredded cheese. Spread the vegetables on the bottom of the pie crust and then carefully pour the egg and cheese mixture over it. Spread out the cheese if it stuck together. Bake for 35 minutes or until the top is light golden brown and a toothpick comes out clean. Allow to rest for 5 to 10 minutes before slicing. Lately my kids have been on a veggie strike and I’m not sure what happened! They used to be really good about eating vegetables, but lately any vegetable has been a no-go. They love sausage so I thought I would have a winner with this dish….nope, they turned their noses up at it. Both my husband and I enjoyed this dish. It was quick and easy to make especially during the week and we had leftovers for lunch the next day. I like the combination of the brussels sprouts and sweetness from the butternut squash. I mean you can’t go wrong with roasted vegetables..we’ll for adults at least. Preheat oven to 400 degrees. Line a baking sheet with parchment paper. Spread the vegetables on the baking sheet and then place the sausage on. Drizzle the olive oil and turn to coat. Season with salt and fresh ground pepper. Roast for 25-30 minutes or until your vegetables are fork-tender and the sausage is cooked through and the skin is crispy. I recently received a discount code to try out HelloFresh and was excited to try out this service. HelloFresh “delivers delicious and healthy recipes with all the pre-measured ingredients to your door each week.” There are two type of boxes to choose – Classic Box and Veggie Box. The Classic Box includes meat and is a little more expensive than just the Veggie Box. I opted for the Veggie Box, because I’m always looking for vegetarian entrees and other side dishes. After you select the type of box, you can select boxes for either 2 or 4 people. I went with the 3 meals, 2 people box. It was the perfect size for my husband with enough leftover for the kids to nibble at. When I received my first box, I was pleasantly surprised. It came packaged with frozen water bottles to keep the produce cool, my second box came with reusable freezer bags. Each meal is packaged together in a bag and includes everything you need! My one meal came with the cutest little bottle of balsamic vinegar. 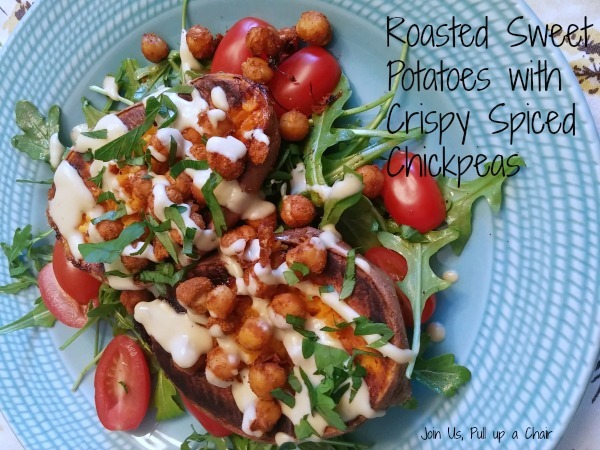 Roasted Sweet Potatoes with Crispy Spiced Chickpeas – We loved this! The hummus dressing was perfect and I loved the crunch of the chickpeas. It was unique and something I would never had put together before. Honey-Roasted Squash with Warm Mushroom & Quinoa Salad – This was another winner. I made it as a side dish for grilled chicken breasts. You can’t go wrong with roasted squash! I really enjoyed the mushroom and quinoa salad, it was a new way for me to use quinoa. My husband had it as leftovers the next day and he really enjoyed it as a cold salad. Eggplant & Sun-dried Tomato Pasta – I’m not a fan of eggplant, so I skipped this meal, but made it for the rest of the family. They liked it but wasn’t in love with it like the other two dishes. Overall, I was really pleased with the boxes I purchased and will use the service occasionally. Now that summer is almost here, I’ll be using the recipe library for inspiration for new meals to make! Do you subscribe to HelloFresh? What do you think of their service? Ready to give HelloFresh a try? Save $40 off your first box when you use my referral code: UB7U8M. I was not financially compensated for this post and purchased a HelloFresh box. The opinions are completely my own based on my experience.This post contains affiliate links, which means I receive a referral fee if you make a purchase using the above code.